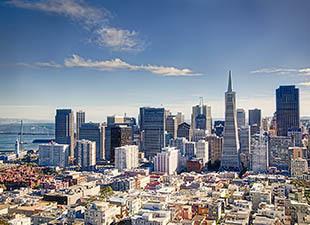 San Francisco is a city of many neighborhoods, each with its own good eats. 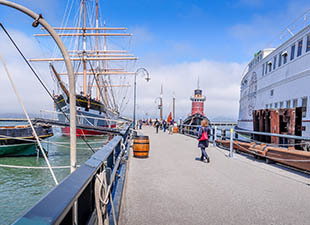 Should you eat your fill of sourdough bread and fresh crab down at Fisherman’s Wharf? 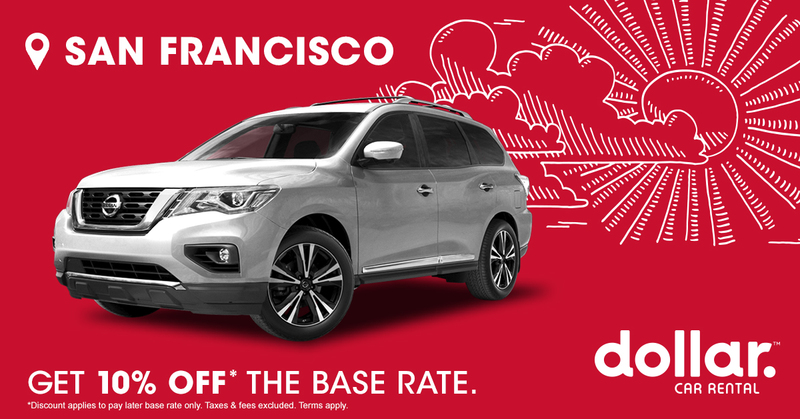 Most definitely — but don’t stop there because San Fran has so much more to offer. Take a detour off the beaten path, and follow the locals to some of the best spots in town. 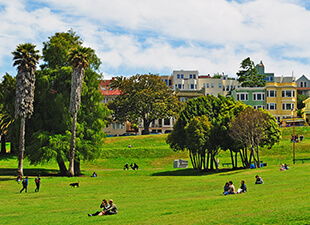 Hayes Valley is a hipster neighborhood with shopping, theaters, and more than a few places to let loose. Check out Biergarten, a neighborhood beer garden where they grill up sausages on sunny days. Other options include pickles, pickled eggs, and some truly epic pork belly sliders with red kraut salad and Russian dressing. Check the board for the current selection of beers. Souvla is a crazy popular Greek spot with rotisserie meats served in pita sandwiches or on salads. The prices are great, and you can eat there or take your sammie to the park a couple of blocks away to do some people watching and plan your next move. For ice cream that’s anything but ordinary, head to Smitten. An aerospace engineer — so, basically a rocket scientist — designed the high-tech contraption that makes the ice cream using the wonders of modern science. What does that mean exactly? Liquid nitrogen, of course! The ridiculously good ice cream is made to order, and the amazing flavors include peanut butter banana and cookie dough with pretzels and chocolate chips. Head West from Nob Hill to Polk Gulch, a neighborhood filled with markets and plenty of bars. A relatively new spot is Buffalo Theory. (If you know your TV trivia, you know the name comes from an episode of “Cheers.”) Try one of the craft beers, and dive into some chicken wings or oysters at bargain prices during happy hour every day from 5:30 p.m. to 7 p.m. You also score a dollar off beer and wine. Everyone loves Bob’s Donuts. It’s open 24/7, so the donuts are always fresh — sometimes even warm. 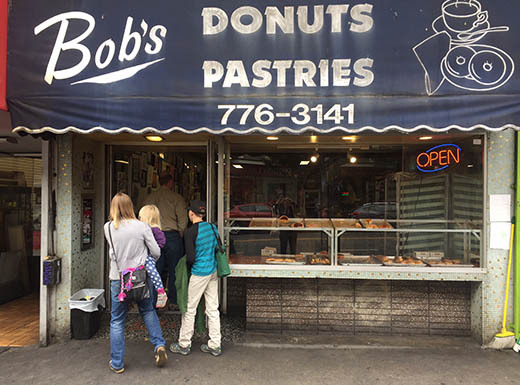 A classic since 1960, Bob’s makes every kind of donut you can think of, including one as big as your head. If you’re up for it, take the Bob’s Challenge and eat that massive belly buster donut in 2 minutes to get a free drink, a Bob’s Donuts T-shirt, and your name listed on the wall of fame. And the free massive donut, of course. Eat up! Further down Polk Street, Leopold’s is basically a frat house meets traditional Austrian village gasthaus. It’s noisy and boisterous — and a whole lotta fun. The rich, hearty food is guaranteed to make you need a nap. Traveling with a group? Share the massive platter with pork ribs, smoked pork loin, bratwurst, sauerkraut, and butter caraway potatoes. Everyone loves pizza, and Fiorella offers it for brunch, lunch, and dinner. Hang out on the back patio, and dig into a meatball sub or scarf down a pizza with salami and an egg on top if that’s your thing. Kids go nuts for the fancy pants Italian chocolate pudding called budino made with local Guittard chocolate. Eat Americana is an American diner with a twist. Chef James Moisey makes super crave-worthy comfort food. 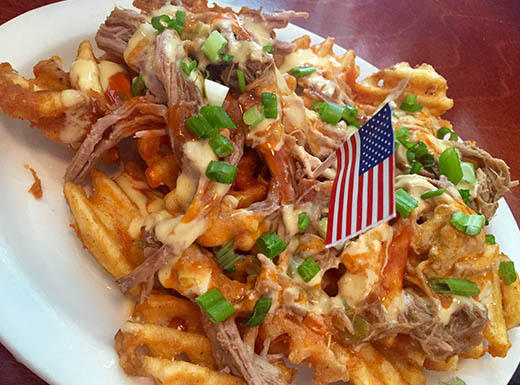 The pulled pork waffle fries are a masterpiece topped with gooey cheese sauce, spicy buffalo sauce, and an American flag. On a rainy day, nothing tastes better than the super thick grilled cheese sandwich, oozing with cheddar and American cheese on Texas toast. It’s served with tomato soup, naturally. No matter which neighborhood you choose to visit, you won’t go hungry in San Francisco. Visit us on Facebook to share your favorite dining discoveries. 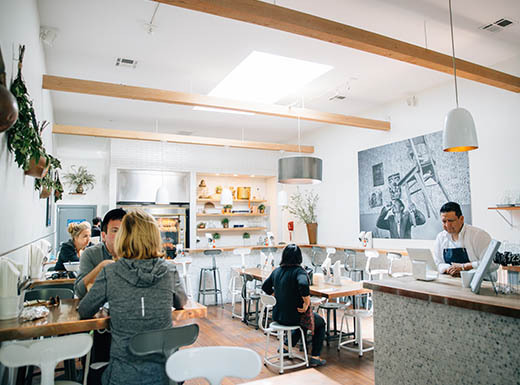 San Francisco’s Mission District is a great place to grab a bite. While you’re there, use this guide to check out all the other awesome attractions.